In Spider-Man: Homecoming, a few scenes where Peter gets beaten with little to no harm really bothered me. And is just mildly disoriented as well as experiencing a little nose bleed. Now I know Spider-Man is very powerful and resilient but I don't think it is to that extent. (I am pretty sure he can not withstand bullets so his skin should have been punctured at one point). I am asking only about his non-Stark costume scenes. Are the scenes we see in the movie from any comics ? Is Spider-Man actually that resilient or was it just the film maker decision ? In the comics, Spider-man has always been very strong and had great resistance to Blunt force. In the previous movies, this aspect was explained (but arguably not used as much), but just like most of the backstory (Radioactive spider bite, Death of uncle ben, etc), Homecoming has barely referenced it at all, mostly because there were already lots of people who weren't interested in watching "just another spider-man reboot", and didn't care if it was part of the shared universe this time, or made by another studio, etc. The writers probably decided that most people knew the backstory, and they could skip that part to get more time for actual new content. Unfortunately, this means that some people might have no idea why Spider-man is so powerful. He is not immune to sharp objects or puncturation (bullets), but is more likely to survive them because of his (pretty weak) healing factor, large reserves of stamina (and more efficient rest to regain stamina fast), superhuman strength and resistance, and spider-sense. Spider-man's resistance is not fixed, and unless the force is obviously weak (normal person punching him) or obviously deadly (getting hit by a large meteor), the plot usually dictates how much anything blunt will hurt him, depending if the writers need him to pass out or to keep fighting. Furthermore, even though it hasn't been explicitly mentioned in the movie, Marvel has stated that Peter does have the spider-sense in the MCU. He probably hasn't learned to use it efficiently yet, and maybe he hasn't even noticed it, but one possible explanation for surviving the collapsing building or crashing plane could be a subconscious spider-sense fueled reaction protecting his more vulnerable body parts, like most of the head and joints, with his arms and legs (he is also extremely agile!). Minimising the strongest part of the impact, and being incredibly resilient overall, would probably be a credible explanation. Of course, the movie also made a point to show that Peter was already worn out before even getting to the plane, because of the building thing, and he was barely able to move after that crash. He is resilient, but not immune at all. So yes, in many comics, spider-man is that resilient, and so the film makers decided to make it so in Homecoming. 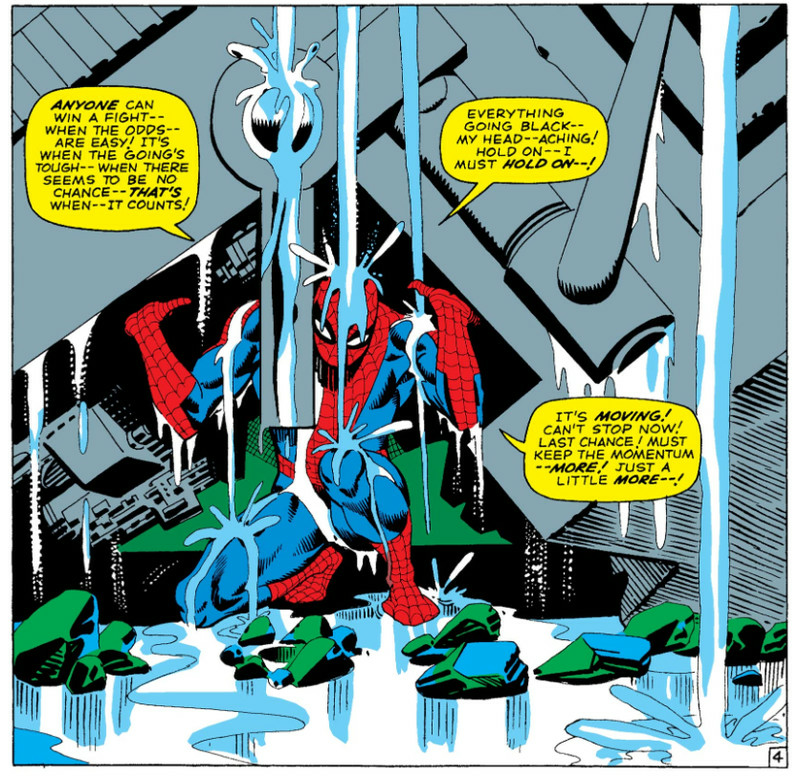 As for the scenes thing, I wouldn't be able to give you any specific examples, but after 50 years of spider-man comics, plus the numerous team ups with the Avengers, the X-men, Deadpool, and all the other teams in Marvel Comics, I would assume that he has been pinned Under a collapsed building and in a crashing plane at least once. The opposite would be extremely surprising. Spider-Man remembers how Tony Stark scolded him for relying too much on his suit, and dramatically wills himself to lift the concrete over his head and escape. This tableau evokes a famous 1965 story arc called “If This Be My Destiny,” in which Aunt May becomes terminally ill and Spider-Man must retrieve a serum from the underwater hideout of Doctor Octopus to save her life. The conflict comes to a head in The Amazing Spider-Man #33, where Spider-Man finds himself at his weakest point imaginable: He’s exhausted from his battle with Doc Ock and trapped under “tons of fallen steel" in a room that’s quickly taking on water. Unable to reach the serum he needs to cure his dying aunt, the ghostly visage of May and Ben (of course) loom in front of him for maximum angst. It takes him four agonizing pages to lift the machinery off of himself, and in all that time he waxes poetical about overcoming his desperate plight. Spider-Man has always been that resilient. He is not among the heaviest hitters in the MCU like Hulk or Thor, but he has the proportional strength of a spider. He can lift and take hots from tons of force. Most depictions of Spider-Man have him running around in long underwear, basic cloth that Parker sewed himself. At best he uses leather or other fabrics like those used in motorcycle jackets, but flexibility limits it. Keep in mind, Spider-Man Is superhuman. He is easily stronger than cap and Bucky. He's regularly seen getting buried under broken buildings without anything more than costume damage. He can dead lift cars. He has an accelerated healing that allows him to recover from the super human fights he's in. Not the answer you're looking for? Browse other questions tagged character marvel-cinematic-universe spider-man-homecoming .